This post continues the series of weight progress reports from the previous one. This report marks one year from my New Year’s resolution at the beginning of 2015. At the beginning of the year, I said I wanted to drop my weight by 10–15 pounds, by which I meant a target weight of 160–165 lbs 0r a BMI of 22.5–23 kg/m2. During the course of the year, I re-defined my goal to a target weight of 155–160 lbs or a BMI of 21.6–22.4 kg/m2. I reached that target range in April, and pretty much stayed there until the end of September, when I had a sudden spike in weight that took me about a month to correct. November and December were not good for my weight, which has drifted up to hover around 161 lbs. 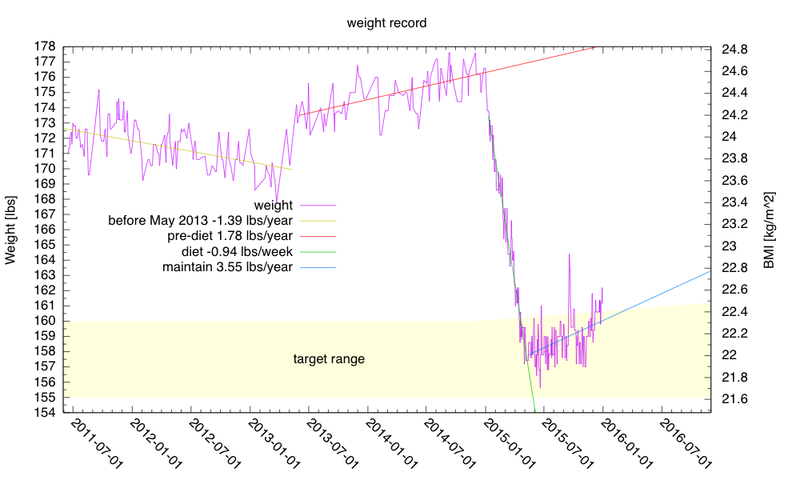 2015 weight record, showing successful weight loss followed by almost successful maintenance. My weight has drifted outside my target range several times, and the holidays have been particularly bad for keeping it in bounds. I’ve adjusted my target weight to gradually relax the upper limit, to allow it to increase at 0.6 lbs a year, which would allow me to drift up t0 178 lbs over 30 years. But I’m currently over even my relaxed limit, so I’ll have to go back to my strict raw-fruits-and-vegetables-for-lunch diet, which I have not been keeping to very well lately. My Body Adiposity Index now estimates my body fat at 23.4%, while the estimate from BMI is 24.8%. According to some calibration studies on people in Louisiana, neither estimate is particularly accurate—by that study, the correct value should be around 18±5%. My exercise for December is way down also (only 2.48 miles/day of bicycling, down from 4.28 miles/day in November) and my total mileage for 2015 is only 1479.4 miles. I was going to do some cycling with my son over break, but he got some mild gastrointestinal bug, and I’ve been a bit under the weather also, so we never got around to doing the bike rides we had planned. Even the short ride we attempted to UCSC to film a short video on oscilloscope usage got cancelled when he threw up halfway up the hill (the first symptom of the gastrointestinal bug, other than fatigue). My son and I have started on his summer project while he is home for winter break—to build a moderately bright, adjustable color theater light for WEST Performing Arts, the children’s theater troupe he has worked with for the past 11 years (including the two years before they split off from Pisces Moon). The theater has a few 15W RGB lights with DMX control, the American DJ Mega Tripar Profile, but they are only 5W per channel (not really bright enough) and it is not clear what functionality the DMX controller for them has (we didn’t look at it or find out the model number). Because the set was a very cheap lighting set, it probably can’t handle the greater functionality we’re planned for the RGBW lights, so we’ll probably have to find or design a simple DMX controller that can be run from a Mac laptop. There are some open-source DMX controller projects on the web, but their user interfaces may be a bit too complicated for the kids (or non-techy staff) running the light booth for WEST. It is not clear whether we can design a simpler interface for a small number of lights that provides easy access to all the functionality of the lights. There is also the question whether a traditional control board with sliders or an all-virtual laptop-based controller is a better interface for beginning lighting techs. We might even want to look at an iPad-based controller, like Luminair ($90), LightingPad (discontinued), and RunTheShow (free, but limited to controlling their particular hardware). LightingPad says that they have pulled the product until they can update for iOS8, which was released over a year ago—since iOS9 has come out before they updated to iOS8, it seems unlikely that they will ever be able to keep up with the churn in the iPads (a complaint I’ve heard from other iPad app developers—Apple makes it very difficult for older apps to keep running, requiring a full-time developer just to keep up with Apple breaking things on each release). Hmm, I seem to have talked myself out of developing an iPad app, but we probably should make sure our hardware can run with controllers like Luminair. For laptops, there are open-source projects like Elios and WhiteCat. Elios is an open-source project in Java, but it hasn’t been updated for a couple of years, so may be a dead project. WhiteCat seems rather complicated, based on the screenshots at http://www.le-chat-noir-numerique.fr/index_eng.html, and most of the documentation is in French, which neither my son nor I reads. Since we’re mainly interested in running on MacBooks, the OS-X-only code from LightKey may be usable. They have a free version with 24 channels that might be usable, though upgrading to more channels gets into an expensive subscription model. The controls we are planning for the RGBW light were 16-bit PWM on each of the 4 channels, plus a strobe frequency (in units of 0.1Hz, with 0–5 and 250–255 having special meanings—probably always off and always on). Because the DMX512 protocol only has one byte per channel, the light would need 9 channels, and the free version of LightKey could only control 2 such lights. RGB, color macros, strobe or program speed, preset programs, master dimmer. The preset programs are mainly for running the light as a standalone light show without a DMX controller, so we would not want to emulate that. The 4-channel RGB,dimmer function is intended as a workaround for the low resolution of 8-bit PWM control—you pick the color at full brightness, then multiply by the dimmer setting to get the overall effect. Since we are planning to use 16-bit PWM, we can get more precise color control even at dim light settings. If we mix our light with the Tripar Profiles, we would probably use the Tripar Profiles in 4-channel mode (unless we needed strobing, in which case we’d use 6-channel mode). I mentioned above that we’d been through three different processor choices. At first we thought of using a Teensy board, because we’re familiar with ARM programming, the Teensy boards are easy to program, and they can be treated like a through-hole part for doing prototyping (by adding some header pins). But the boards are a bit large, and a bit expensive ($11.65 for a Teensy LC), so we next considered using an ATtiny2313A processor (again, the ATtiny is easily programmed and I have some experience with the ATtiny13, which I used for the PWM on my desk lamps). Unfortunately, the ATtiny2313A provides only 2 16-bit PWM channels (plus 2 8-bit channels), which is not really adequate. Using two ATtiny2313A chips would work, but for less money and less board real estate, we can use a PIC32MX110F016B-I/SP and get 16-bit PWM on a 40MHz clock for a 610.4Hz PWM frequency. The flexibility of the pin remapping on the PIC32 is attractive here, as it can simplify the routing of the board. 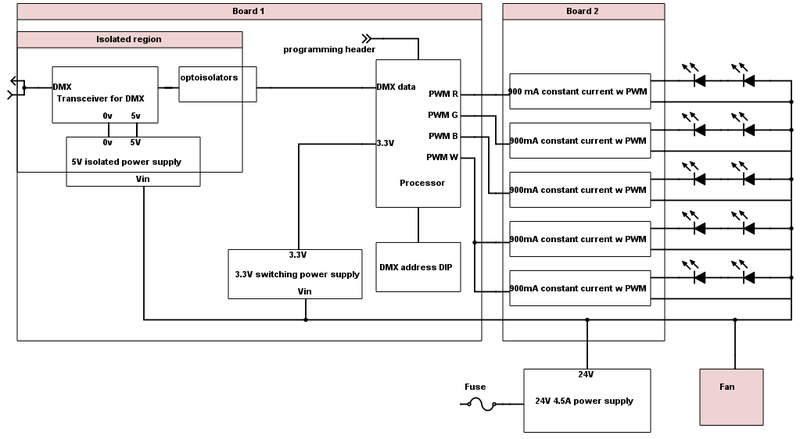 The processor not only has to interpret the DMX commands and provide PWM outputs, it also has to support the RDM (remote data management) protocol of modern DMX devices (the Tripar Profiles don’t, but there is no real excuse for not supporting RDM these days). Each LED here is nominally a 10W LED module. We’ve given some thought to the heat sink, fan, and mounting brackets for everything, but there is still more work to be done to make sure that we can really dump all the waste heat and keep the LEDs sufficiently cool. We’re currently looking at about $80 in parts for the light (not including the can, which we’ll get from WEST) plus another $15 to make a USB-DMX interface that can handle the RDM protocol. Those numbers may change a fair amount as we play with the design. The two boards are each about 10cm by 5cm, which cost only $12 (for 10 copies) from Smartprototyping. My son has done preliminary layouts of them, to see how big the boards would be and determine any mechanical problems we might encounter. If I were requesting a general-education code for the course, I would also have to fill out one of the thirteen general-education forms (corresponding to the 13 possible general-education codes for a course at UCSC), listed at the bottom of the supplemental sheet. The supplemental sheet was simplified this year, by pushing all the general-education forms out to separate forms, but the requirement for a course syllabus is new. Basically, the supplemental sheet asks more or less the same questions as before, rephrased to “where on the course syllabus …?” The “learning outcomes” question is new, as it reflects a relatively new bureaucratic approach to curriculum design. The learning outcomes make a lot more sense at the course level than at the degree level, where the administration has been pushing for them. The split course is a pair of 4-credit courses, representing a total time of about 250 hours (240–263 hours), 140 of which are contact hours (3.5 hours of lecture and 3.5 hours of lab a week). I’m thinking in terms of MWF lectures (70 minutes each) and TTh labs (105 minutes each). That should be easier to schedule than the 7-unit BME 101/L these courses will replace, which takes about 220 hours (210–232 hours), 95 of which are contact hours (3.5 hours of lecture and 6 hours of lab a week). The increased contact hours should result in students learning more, as many of our students are not very efficient at learning on their own. One thing I’ll have to decide is whether to require all bioengineering majors to take both courses, or whether BME 51A is enough for the biomolecular concentration. For the bioelectronics and assistive technology: motor concentrations, both parts are needed both for the content and for the lab experience. But for the biomolecular and assistive technology: cognitive/perceptual concentrations, the courses are mainly there to teach engineering design practices. The assistive technology: cognitive/perceptual concentration relies on software courses for design content, and so BME 51A is probably enough for them, but there are very few design courses for the biomolecular concentration, as biomolecular lab work is very slow, and a full-year capstone sequence is barely enough for one iteration of one prototype. 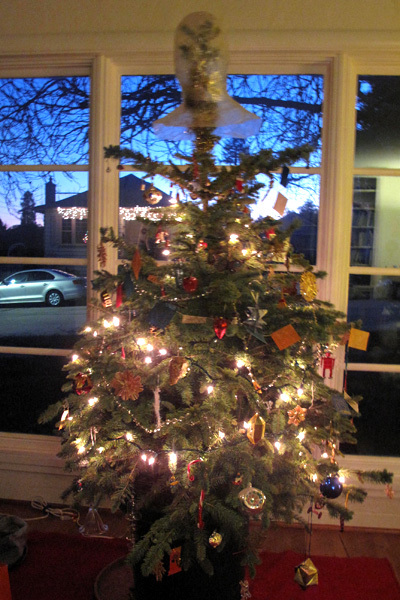 We celebrate a number of different holidays in our house around this time of year: Channukah, Winter Solstice, Christmas, Festivus, … . 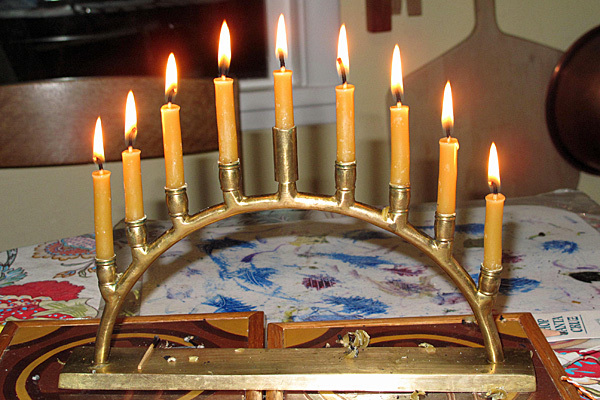 For Channukah, we light the menorah with the traditional blessings, give trinket presents, eat latkes, and play dreidel. 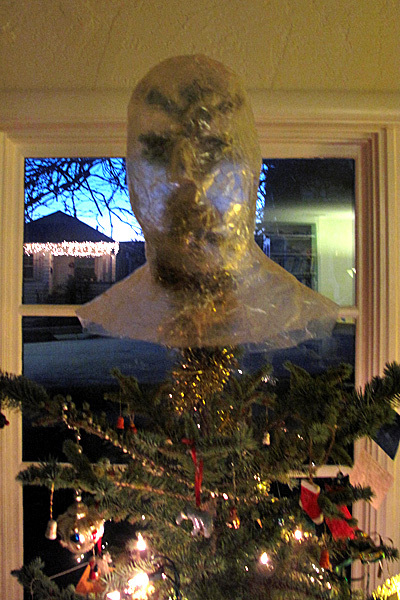 For Christmas, we decorate a tree, light up the porch, and give slightly larger presents. For Solstice, we eat round solstice cookies (basically shortbread). For Festivus, we have a tiny Fesitvus pole.